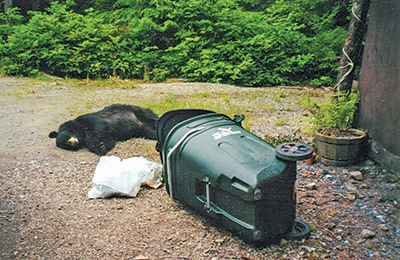 A bear destroyed as the direct result of improper garbage storage and disposal. Keeping bears away from human food is perhaps the most important thing we can do to prevent conflicts and confrontations between bears and people. It is against the law to feed bears. The law states, "A person may not intentionally feed a moose, deer, elk, bear, wolf, coyote, fox, or wolverine, or negligently leave human food, animal food, or garbage in a manner that attracts these animals" (State Regulation: 5AAC 92.230(a)(1)). It is also against the law to kill a bear you have attracted by improperly storing human food, animal food, or garbage. Feeding bears is dangerous for both people and bears. Bad habits are hard to break and bears are creatures of habit. Bears seek out the same wild foods in the same places year after year. Bears conditioned to eating human food will similarly return to neighborhoods, campgrounds, and dumpsters, until food is no longer available or they are killed. Remember: Food conditioned bears can be aggressive. Leaving out bear attractants, such as garbage, birdseed or fish waste can draw bears into neighborhoods or campsites. A person who allows bears to feed on improperly stored food or garbage is putting other people at risk. Preventing bear problems is everyone's responsibility. Work within your neighborhood and community to encourage others to manage their garbage, dog food, birdseed — anything that might attract a bear. Keep all human sources of food out of reach of bears. If there is a bear in the neighborhood, let people know. Work together to protect your neighborhood and to keep people and bears safe. Store garbage and animal feed inside secure buildings or in bear-proof containers. Keep your garbage secured until just before scheduled pickup. Some Alaska communities prohibit garbage to be outside in an unsecured manner except for the morning of trash pickup. Even if it's not required by law where you live, encourage neighbors to keep garbage secure in a garbage, study shed or a bear-resistant container until the morning of trash pickup.If you take your garbage to a collection site, do so regularly. Make sure to place it in the dumpster and close the lid. These collection sites attract bears. Take down all bird feeders and clean up birdseed when bears are active. Bears, especially black bears, like birdseed and suet. Don't feed birds from April through October or even November, depending on the weather. Clean up uneaten food and seed hulls each spring when you put your feeders away. Bears like pet food, livestock feed, meat scraps and fish. Keep them in a secure place. Be sure to bring uneaten pet food inside when pets are done eating. Store livestock food out of reach of bears. Barbecues can also be powerful attractants. Storing them in a protected place and cleaning grease from grills after each meal helps to discourage bears. Do not leave a meat or fish smoker unattended. If you are planning on leaving, protect fish and meat drying racks and smokehouses with electric fencing. Place your garden so it doesn't attract bears. Placing your garden in the open, away from cover and game trails, helps to discourage bears. Avoid composting anything you think a bear might like to eat. Fish and meat are favorites, and seaweed and kelp have enough fishy smell to attract bears. Close and lock all doors and windows bears could climb through. This includes your garage door. Keep it closed if you're not nearby. Domestic animals draw bears. Keep them where they are safe and use an electric fence to protect livestock enclosures. Chickens and rabbits kept in outside pens are easy and attractive prey. Electric fences can be effective. If used properly, electric fences can keep bears out of gardens and compost piles. They can also protect cabins and domestic animals. Keep your property and vehicles as clean as possible and reduce attractants. This includes all the obvious attractants such as garbage and bird seed, plus animal hides, bones, fish, seal oil, waste water, fish tackle, fishing nets, dry racks, petroleum or rubber products and fuel cans. At cabins, pack your garbage out. When staying at a remote cabin, keep your garbage in a secure building or in a bear-proof container such as a steel drum fitted with a locking lid. Never bury your garbage; bears can still smell it and might dig it up. Burning garbage can also attract bears. When leaving a remote cabin, it's best to pack all garbage out. Also consider boarding up the structure with thick wood with nails pointing outward, or protecting your cabin with electrified mats or an electric fence. What we can do when hunting, camping, and hiking. Plan how to keep food and bears separate before you start out. Bear-proof containers should be part of every camping trip in bear country. They are available at major outdoor stores and are required equipment for backpackers in most national parks. Keep a clean camp and don't leave unattended food out where bears might get into it. Photo by Interagency Grizzly Bear Committee. Keep a clean camp. Don't leave unattended food where bears can get to it. If possible hang your food where bears can't reach it or place it in bear-proof food containers. If you leave camp, don't leave anything a bear might like to eat. If food or garbage cannot be secured it should be placed far away from human and bear activity. Cook where you can see an approaching bear. This gives you time to see bears at a distance. 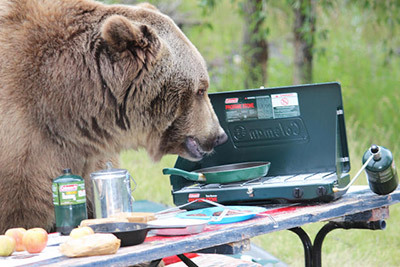 Plan what you would do if a bear came near while you were cooking dinner. It helps to keep track of wind direction as bears are more likely to approach from downwind. Many experienced outdoors people eat early so that they'll still be awake if a bear comes to investigate dinner smells. Some backpackers even stop and cook before they reach their camp site so that there are no food odors near where they sleep. Don't cook smelly foods. Bacon can bring in bears from a long way — especially if they've had it before. Bears have an incredible sense of smell. Not only do bears react to scents they come upon accidentally; they purposefully use their noses to "search" for food. Don't sleep where you eat and cook. Moving off 100 yards or more is helpful. Keep snacks, toothpaste, cosmetics, anything with interesting smells and any clothing that has been soiled by food or game butchering out of your tents and with your food supply. Don't fish around bears. Do not fish when bears are close enough to notice a fish splashing on your line. This may mean a distance of several hundred yards or more. If bears are fishing where you want to fish, make sure you are a safe distance away and do some bear watching. Don't let bears get your fish. If you make a mistake and a bear runs after the salmon you have hooked — cut it loose. Bears are quick to associate fishermen with easy fish meals. If you clean fish next to a salmon stream, only discard fish guts into fast-moving water, and place butchered fish in plastic bags to contain. Keep your catch with you. Do not leave it unattended on the stream bank. Field dressing of game can attract bears. If you harvest an animal, it's best to have two people do the field dressing, with one of them keeping a sharp lookout out for bears. Pack, do not drag, all salvaged meat and animal parts to the area where you will hang or store your meat. Move edible meat and salvaged portions a good distance from the gut pile, to an area with good visibility. Cache meat out of reach of bears if possible, or at least away from your camp. 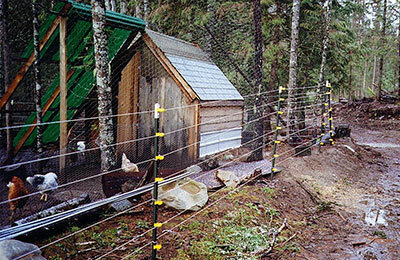 Portable electric fences are an inexpensive way of protecting your meat and deterring bears. Use this checklist (PDF 403 kB)	to make sure you have cleaned up all bear attractants around your home or property. If you want to encourage your neighbors to store their garbage and other bear-attractants responsibly, you can put one of these door hangers on their door (PDF 373 kB) to remind them. ADF&G provides these to neighborhoods upon request.